Switzerland, 1914. Carl Jung settles down to sleep, but is plagued with a nightmare vision: Europe, flooded with rivers of blood. Uziri, British East Africa, a spat between Tarzan and Jane coincides with the appearance of a malevolent witch doctor. Jane falls under a dark spell and becomes cold and zombie-like. Unable to cure her in Africa, Tarzan must take her to Europe, to a specialist in diseases of the mind: Dr. Sigmund Freud. 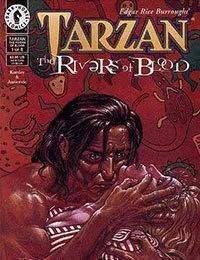 As the world teeters on the brink of war, Tarzan may be the key to unlocking the secrets of consciousness... but all he cares about is getting his wife back... and revenge!